Last week, the navy recovered 900 kg of cocaine floating off the coast. 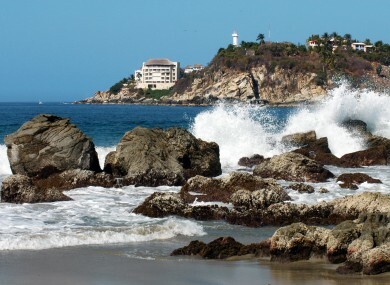 Puerto Escondido is a famous destination for surfers. GUNMEN BURST INTO a home and killed eight shark fishermen from the same family in Mexico’s Pacific beach resort of Puerto Escondido, authorities said today. The armed group arrived in a vehicle last night, stormed the house and opened fire with high-caliber weapons in the southern state Oaxaca, officials said. “Four men died at the scene and four more, also males, died in a hospital during treatment,” Joaquin Carrillo Ruiz, Oaxaca’s chief prosecutor, told AFP. The victims were all fishermen who caught sharks, but the prosecutor’s office said in a statement that investigators were looking at whether they were involved in illicit activities. It did not give more details about the investigation, but drugs are moved off the coasts of southern Mexico. Last week, the navy recovered 900 kg of cocaine inside 33 packages that were floating off the coast of Chiapas state, south of Oaxaca. Authorities had earlier confirmed seven fatalities but the eighth victim succumbed to his wounds today. Puerto Escondido is a popular tourist destination and is beloved by surfers worldwide. Oaxaca has been relatively spared of the drug violence afflicting other regions of Mexico. It was the latest deadly attack against an entire family in Mexico. Earlier this month, 11 members of one family were gunned down in Ciudad Victoria, capital of the northeastern state of Tamaulipas, and three others from another family were killed the same day. Officials said the two incidents may have been linked to a dispute between rival gangs. A week later, five relatives, including three children, were murdered by an armed group in Ciudad Victoria. Email “Drug probe after eight shark fishermen from the same family are massacred”. Feedback on “Drug probe after eight shark fishermen from the same family are massacred”.